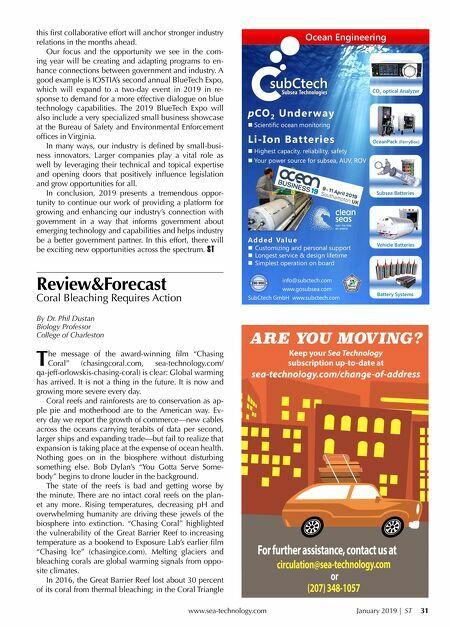 www.sea-technology.com January 2019 | ST 31 Review&Forecast Coral Bleaching Requires Action By Dr. Phil Dustan Biology Professor College of Charleston T he message of the award-winning film "Chasing Coral" (chasingcoral.com, sea-technology.com/ qa-jeff-orlowskis-chasing-coral) is clear: Global warming has arrived. It is not a thing in the future. It is now and growing more severe every day. Coral reefs and rainforests are to conservation as ap- ple pie and motherhood are to the American way. Ev- ery day we report the growth of commerce—new cables across the oceans carrying terabits of data per second, larger ships and expanding trade—but fail to realize that expansion is taking place at the expense of ocean health. Nothing goes on in the biosphere without disturbing something else. Bob Dylan's "You Gotta Serve Some- body" begins to drone louder in the background. The state of the reefs is bad and getting worse by the minute. There are no intact coral reefs on the plan- et any more. Rising temperatures, decreasing pH and overwhelming humanity are driving these jewels of the biosphere into extinction. "Chasing Coral" highlighted the vulnerability of the Great Barrier Reef to increasing temperature as a bookend to Exposure Lab's earlier film "Chasing Ice" (chasingice.com). Melting glaciers and bleaching corals are global warming signals from oppo- site climates. In 2016, the Great Barrier Reef lost about 30 percent of its coral from thermal bleaching; in the Coral Triangle this first collaborative effort will anchor stronger industry relations in the months ahead. Our focus and the opportunity we see in the com- ing year will be creating and adapting programs to en- hance connections between government and industry. A good example is IOSTIA's second annual BlueTech Expo, which will expand to a two-day event in 2019 in re- sponse to demand for a more effective dialogue on blue technology capabilities. The 2019 BlueTech Expo will also include a very specialized small business showcase at the Bureau of Safety and Environmental Enforcement offices in Virginia. In many ways, our industry is defined by small-busi- ness innovators. Larger companies play a vital role as well by leveraging their technical and topical expertise and opening doors that positively influence legislation and grow opportunities for all. In conclusion, 2019 presents a tremendous oppor- tunity to continue our work of providing a platform for growing and enhancing our industry's connection with government in a way that informs government about emerging technology and capabilities and helps industry be a better government partner. In this effort, there will be exciting new opportunities across the spectrum. ST Ocean Engineering Li - Ion Batteries Highest capacity, reliability, safety Your power source for subsea, AUV, ROV A d d e d Va l u e Customizing and personal support Longest service & design lifetime Simplest operation on board p CO 2 Under way Scientific ocean monitoring info@subctech.com www.gosubsea.com SubCtech GmbH www.subctech.com CO 2 optical Analyzer OceanPack (FerryBox) Subsea Batteries Vehicle Batteries Battery Systems Keep your Sea Technology subscription up-to-date at sea-technology.com/change-of-address ARE YOU MOVING?